If you are missing the Windows Vista Ultimate edition extras in Windows 7, here is good news for you. Microsoft has released Tinker game for Windows 7, Vista & XP, and is ready to download now. Tinker is an isometric two-dimensional puzzle available for free. Tinker features a tutorial level to get you started. Featuring captivating visuals, an original music score, and 60 levels that range from the facile to the extremely challenging. # Guide your small robot through 60 different levels of inventive mechanisms, switches, lasers, teleporters, and more! # Earn Tinker Achievements only available through LIVE. 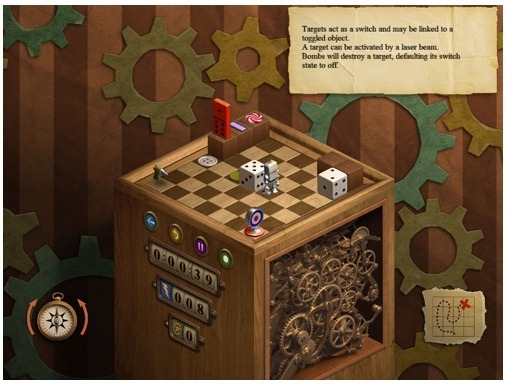 # Enjoy 3D graphics that enhance the majestic clockwork world! And if you are new to addictive Tinker game, refer these Tinker guides to start tinkering! It says I need a product key? if the game is free why would i need a key? also…. its not even on the windows website anymore…. can you help? The game works very well, but not sound, any idea? This stinks: I wish there was an ISO version. I can download files but wwhere I have high speed intetnet, but I cannot take my home computer with me. My internet at home is not very fast (tethered blackberry) and wireless and unlike Torrents; if the download is interrupted then my Microsoft download must be restarted. Is Microsoft going to release an ISO version of this game to help people with poor internet connections? I think Tinker is not 2-dimensional, it is a real 3-dimensional puzzle game.